French chemist and politician; born at Carpentras, Vaucluse, Oct. 6, 1834. After studying in Paris he graduated as M.D. in 1859, and became in 1862 assistant professor at Paris University. In 1863 he was called to Palermo as assistant professor at the polytechnic institute, which position he resigned in 1865. In the latter year he returned to Paris and took an active part in French politics. In 1867 he attended the Peace Conference at Geneva, and, showing himself to be in opposition to the French empire, he was sent to prison for fifteen months, and lost his civil rights for five years. In 1869 appeared his "Religion, Propriété, Famille," for the publication of which he was again sentenced to imprisonment (four months) with the entire loss of his civic rights. Escaping to Spain, he became correspondent for the "Réveil" and "Rappel." In Spain he became involved in the Andalusian insurrection. Returning to France after the promulgation of the amnesty of Sept. 4, 1870, he was employed by the republican government in Tours, later in Bordeaux. In 1871 he was elected to the Assembly, where he joined the Extreme Left. He was reelected in 1873, 1876, 1877, and 1881. In 1882 he was elected to the Senate, and was reelected in 1893. He became a follower of Boulanger, and even when the latter was overwhelmingly defeated in 1888 he still remained one of the general's adherents. Naquet took an active part in the deliberations of the Assembly and the Senate, and fought from 1876 onward for legislation on divorce. His proposed law, after being repeatedly defeated, was adopted in 1884 and became known as the "Loi Naquet." During the following two years he proposed several amendments to it, which were accepted. Having been denounced as a participator in the Panama scandal, he escaped in 1889 to England. Upon his return to France in 1893 he was acquitted. He did not offer himself for reelection to the Senate in 1898. 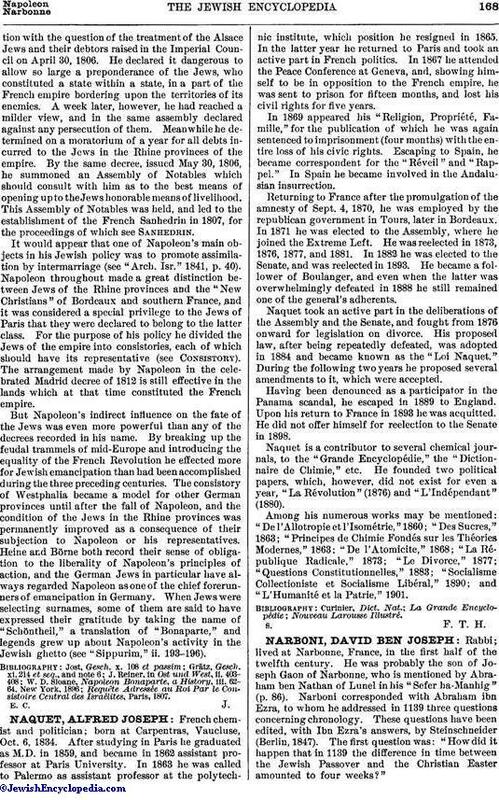 Naquet is a contributor to several chemical journals, to the "Grande Encyclopédie," the "Dictionnaire de Chimie," etc. He founded two political papers, which, however, did not exist for even a year, "La Révolution" (1876) and "L'Indépendant" (1880). Among his numerous works may be mentioned: "De l'Allotropie et l'Isométrie," 1860; "Des Sucres," 1863; "Principes de Chimie Fondés sur les Théories Modernes," 1863; "De l'Atomicite," 1868; "La République Radicale," 1873; "Le Divorce," 1877; "Questions Constitutionnelles," 1883; "Socialisme Collectioniste et Socialisme Libéral," 1890; and "L'Humanité et la Patrie," 1901.